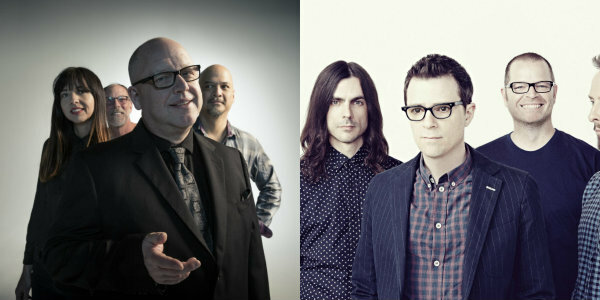 The Pixies and Weezer today announced a 29-date North American co-headlining tour next summer, a trek that will take the two bands’ blends of guitar-pop from coast to coast, performing at a dizzying assortment of corporate-branded outdoor amphitheaters along the way. The tour opens June 23 in Tampa, Fla., and will keep the two bands on the road together through an Aug. 12 date in Phoenix. Along the way, the trek will dip into Canada for a date in Toronto. The announcement follows last week’s release of Weezer’s 11th studio album Pacific Daydream, as well as extensive touring by the Pixies this year in support of that band’s latest album, Head Carrier. The 2018 tour promises “a mix of new songs and classics” from the Pixies, who will play 75-minute sets each night. 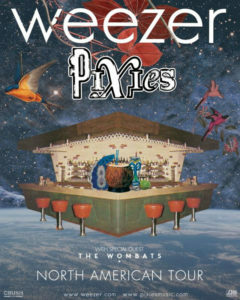 Tickets for the co-headlining trek go on sale beginning 10 a.m. local time Nov. 10; for more information on on-sales and pre-sales, visit the bands’ websites, weezer.com and pixiesmusic.com.